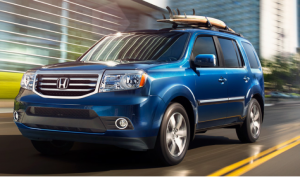 We know that you probably expect us to say that the 2014 Honda Pilot is one of the best midsize SUVs of 2014, considering that it’s one of our brand new Honda models available now at our Central Illinois Honda Dealers, but we’re not the only ones. Kelley Blue Book, the auto value experts, named the 2014 Pilot to their list of the 10 Best Midsize SUVs of 2014 as well. Why don’t we see just what it is about the Pilot that entices drivers. You might expect that high of a fuel economy to come with low engine power, and yet that couldn’t be further from the truth. The 3.5L V6 under the hood of each 2014 Pilot is rated at 250 hp, ensuring you’ve got the power you need when you need it. You’ll also be able to receive text messages straight through the i-MID and can sync the car’s radio with your Pandora station of choice for the tunes you want while cruising in your Pilot. See how competing SUVs hold up to the Pilot. The best way to know if the 2014 Honda Pilot is for you, to see if it’s truly one of the best midsize SUVs of 2014, you need to take it for a test drive. Visit a Central Illinois Honda Dealer near you and let one of our sales experts put you behind the wheel.